Hi, friends, it's been a while. Every time I've wanted to update here, I've had writer's block on what to say. Also, a lot has happened since my last post! I got hitched to Joe, and we had an amazing wedding with our closest family and friends all there. I know it was good because I still get messages from guests telling me how great the food was or how fun their night was. So if anyone is getting married and needs any advice, I'm here for ya! It was a whirlwind--we worked so hard at making it an awesome night, and then it was gone so fast. We did get three days of partying so I guess I shouldn't complain too much. Despite a few snags, the whole wedding turned out beautiful and best of all, I got to marry my best friend and laugh and dance with my family and friends all night. Now it's been about a month since the wedding and I'm still reeling from it. It feels so surreal. We came back home and jumped right back into work. I've been doing so many orders I neglected the blog...But I'm back now and I think I'm ready for a few changes. Here's one of my favorite recipes from the summer. When my friend Rachel had a birthday coming up and said she liked almond cake, I tried to brainstorm what I could make here beyond just an almond extract-flavored cake. We live right by a bakery in St Louis called Piccione, specializing in Italian pastries. I never knew much about Italian pastries until this place opened up, dangerously close to our home. They make tons of authentic Italian baked goods and I've never had a single bad item. One of the things that intrigued me was their tricolor cookie. The girl behind the counter convinced me that it was worth trying, even though I'm not a fan of fruit and chocolate. 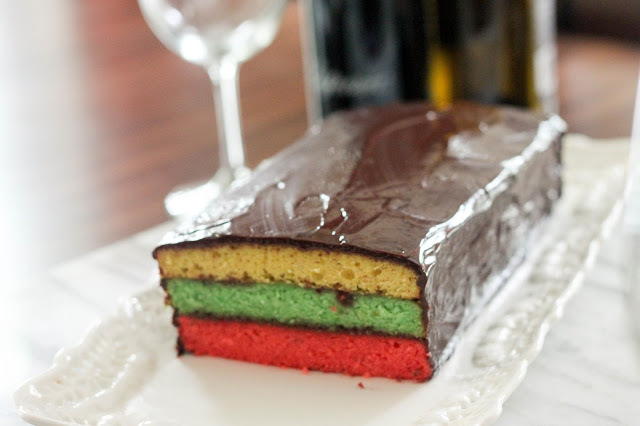 A tricolor cookie is 3 colors, typically red, yellow, and green, sandwiched with apricot or berry jam and half dipped in chocolate. The cookie dough is permeated with almond extract, which has always smelled strongly artificial to me but strangely addictive. I was in love. So for my friend, I thought I'd try this in cake form. I'm no good at making layered cakes but I do think they're perfect for birthdays. I found a wonderful recipe that I slightly adapted--I've seen almond paste in stores but the canned almond pastry seemed like it would be a little more moist and make the cake lighter instead of denser, and it did! The cake can be a little annoying if you only have one baking pan, like I do. It requires some patience to divide the batter, tinge each one with coloring, and bake one set at a time, waiting for the pan to cool before inverting the cake and starting over. 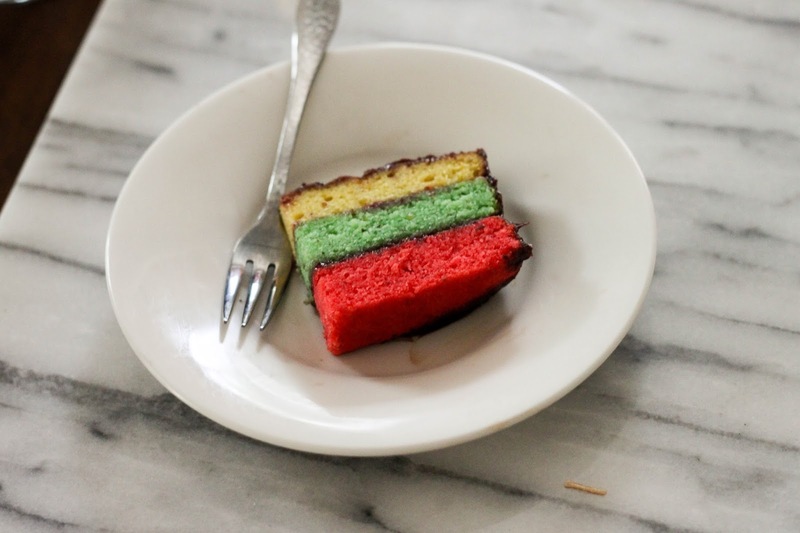 You could bake it all at once without food coloring but then it wouldn't be tricolor! The result was fantastic. I used my favorite Bonne Maman raspberry jam between the layers and even poured some Amaretto over the dry cake before putting the layers together. 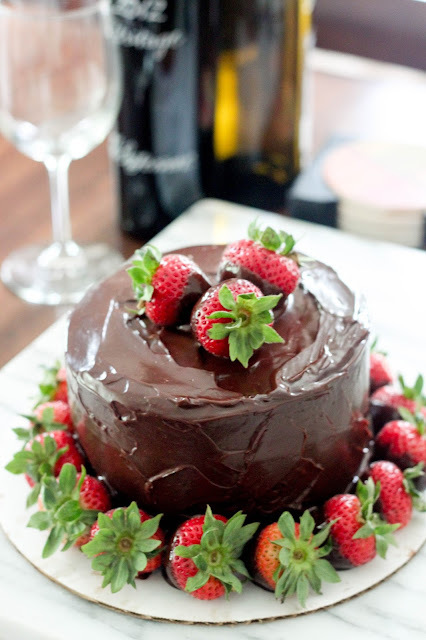 The cake was soft and moist with a heavy coating of chocolate over the top. The best part is cutting into the cake to reveal the different colors. I know food coloring is unnatural but there's just some sort of child-like wonder about eating color, isn't there? This is definitely a keeper, I can't wait to make it again! Also, I made this twice--once as a 6 inch layered cake and once as a loaf cake--feel free to double the recipe if you'd like to make both. • Preheat the oven to 350 degrees. Butter 3 9-by-5-inch loaf pans and line the bottoms with parchment paper. • In the bowl of a stand mixer, cream together the butter and sugar on medium-high speed until fluffy, 3 to 5 minutes. Add the eggs and continue to beat on medium-high until combined, then beat in the almond pastry filling, milk and almond extract and milk until combined. • Use a spatula to gently fold in the flour, baking powder and salt. Evenly divide the batter into 3 medium mixing bowls. Drop enough red food coloring into 1 bowl to achieve the desired color. Repeat with the green and yellow food coloring in the remaining 2 bowls. • Pour the batters into the 3 loaf pans. Bake 20 to 25 minutes, until a toothpick inserted into the center comes out clean. Let cool 10 minutes, then invert onto a cooling rack and let cool completely. • Meanwhile, make the ganache by simmering the cream in a small saucepan over medium heat, until the edges start to bubble. Remove from heat, add the chocolate and cover. Let sit 1 to 2 minutes, then whisk gently until smooth. Let cool to room temperature. • Place the red cake on the serving platter. Drizzle with 2 tablespoons amaretto, then spread 2 tablespoons jam on top in an even layer. Stack the yellow cake on top, drizzle with another 2 tablespoons amaretto and spread the remaining 2 tablespoons jam on top in an even layer. Add the final green layer, drizzle with the remaining 2 tablespoons amaretto, then cover the cake tightly in plastic wrap and refrigerate 20 minutes. 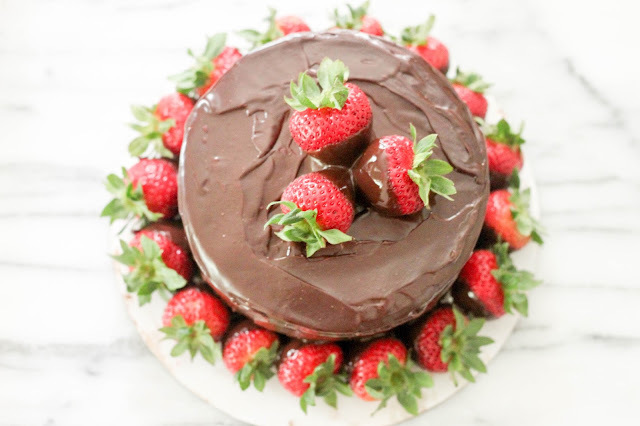 • Unwrap the cake and pour the ganache over the top, spreading it evenly down the sides with a small spatula, until the cake is completely covered. Refrigerate 1 hour to set, then slice and serve with fresh fruit. Love this! 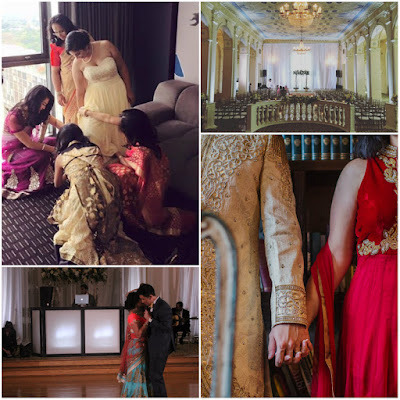 and happy wedding, Amrita! It looks amazing, and i'm sure everyone had a fantastic time. I hear you about neglecting blogs *ahem* and i can't wait to see what you have in store for your new one. Thanks Shannon, sometimes it's just so hard to keep up with writing!